Hyatt and HRI Properties officially opened Hyatt Place and Hyatt House hotels in the Wholesale District of Indianapolis. Developed and constructed by HRI Properties, the dual-branded property represents a prominent landmark within central downtown and creates an experience that enables guests to enjoy both brands under one roof. 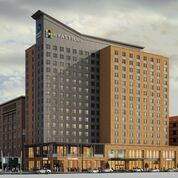 Guests of Hyatt Place Indianapolis and Hyatt House Indianapolis will be able to choose the right setting for their needs – whether that’s a quick business trip, vacation, a work relocation, or a long-term corporate project. The 15-story building offers a unique layout with a large, single lobby serving both the 186-room Hyatt Place hotel and 130-room Hyatt House hotel, as well as plenty of space to have the kind of shared social experiences travellers desire today. Amenities include valet parking, over 6,000 square feet of flexible meeting and event space, indoor swimming pool and fitness facilities, a second-floor indoor/outdoor lobby bar that overlooks Pennsylvania Street, and over 13,000 square feet of ground floor retail space. The development also includes a 382-space parking garage to serve both hotel guests and the general public. The dual-branded property is located in downtown Indianapolis’ historic Wholesale District at the corner of South Pennsylvania Street and East Georgia Street, facing the main entrance of Bankers Life Fieldhouse, home of the Indiana Pacers. This will be the first Hyatt House hotel to open in the state of Indiana. Both properties are managed by HRI Lodging. The Hyatt Place and Hyatt House brands are designed to deliver seamless experiences that are authentic, intuitive and modern, allowing business travelers to remain productive and worry-free, without skipping a beat.